Fleas are hard to get rid of once they have invaded your home. 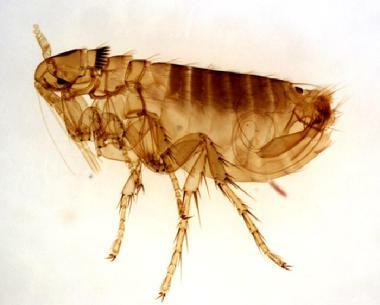 Fleas have a complete life cycle, which means that they start off as an egg, hatch into a larvae, cocoon into a pupae and then hatch into an adult. In two phases of that life cycle, the egg and the pupae stages, the flea is virtually un-kill-able. The thick "skin" of the egg and the pupae won't allow chemical to penetrate, and they can linger indefinitely in those stages until conditions are right for them to eat and reproduce. Hadley Termite & Pest Control always, Always, ALWAYS stresses to vacuum your home before and after treatment. The vacuum cleaner puts out heat, carbon dioxide, and vibrations that tell the immature flea, "Hey! There's food here! Come on out for a bite!" The fleas will believe the message sent by the vacuum cleaner and try to eat it, and not you! Unfortunately, there is no "silver bullet" that kills all fleas and their eggs in one swift stroke. (If you find something that does, please let us know. Free samples are also appreciated.) Therefore! depending on the level of infestation, it may take several trips to rid your home of fleas. Fleas hatch out in a 7-10 day cycle, so our treatments are scheduled for every other week. A minimum of 3 trips is required. 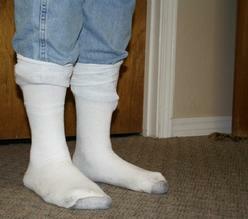 The White Sock test begins by you, the homeowner, wearing pants. Clean pants are especially helpful. Next, grab a pair of white socks from your sock drawer. Put the socks on your feet, and over the outside of your pants. (See picture to the left.) Now scuff your feet as you move around your house. Remember the olden days when you tried to build up a spark of static electricity to zap your little brother with? That's the kind of motion we are trying to achieve. Watch your socks. Do you see black pepper sized specs leaping on and off your feet? Yes? You have fleas. No? You don't have fleas. This is not the definitive test as to whether or not your have fleas, but it's usually correct.